← News : THE BEST of 2018 – Vote for your favourites! Top rock albums and live acts! Win a £50 Amazon Voucher! 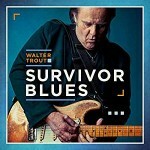 Share the post "Album review: WALTER TROUT – Survivor Blues"
Walter Trout doesn’t do things the easy way, especially when it comes to searching for conceptual meanings for his albums. He’s an old school blues-rock talent for whom the notion of an album is a sacrosanct canvas on which to explore meaning, imagination, deep emotion and always the blues. Over the years he given us titles such as ‘Prisoner Of A Dream’, ‘Go The Distance’, ‘Common Ground’, ‘The Outsider’, ‘Battle Scars’ and We’re all In This Together’, and now comes ‘Survivor Blues’, an album title that encompasses both his band members and the enduring quality of the blues legacy that the post war blues master left us. Having given the project its context, he invites his band to ignite blues history with an insider’s approach that gives the dozen blues songs their vibrant arrangements and lyrical veracity and punch. ‘Survivor Blues’ finds him on a mission to uncover lesser known blues covers and to strike a balance between the past and its relevance in contemporary times. The songs he’s chosen gives the album a substance that frequently mirrors his own career efforts, in as much as he’s always been drawn to wide ranging subject matter to nail his brand of riff-driven blues. And what better way to kick things off than Jimmy Dawkins’s ‘Me My Guitar And The Blues’, which is a distant lyrical cousin to Trout’s own ‘For My Guitar.’ He pours so much raw gut emotion into both his vocals and layers of big toned guitar that you wonder how he’s going to be able to follow such an impressive opening. His guitar resonates and sparkles, his voice holds steady through the deepest of emotions and the band leans into a groove that is a template for the album as a whole. The fact that many of us will have to look up the origins of some of the songs gives you an idea of Trout’s research, which is exemplified by the gnawing intensity of the guitar driven ‘Red Sun’. The slide-led Sunnyland Slim’s ‘Be Careful How You Vote’ taps into contemporary events with a timeless message, as he gives his band plenty of room to stretch out, before he fires off a blistering solo that says more than words could ever convey. There’s a sense of balance too as he teams up spectacularly with Sugaray Rayford on Luther Johnson’s soulful and funky ‘Woman Don’t Lie’. The latter track serves to make Hound Dog Taylor’s ‘Sadie’ feel like a pause for breath, before Trout meticulously builds things up again with an ascending guitar line and supporting organ from Skip Edwards, while his second solo seals the deal. Having explored the full dynamic possibilities of the latter, he counts the band into a rocking version of BB King’s ‘Please Love Me’ as they rejoice in their live in the studio environment. With the exception of his former mentor John Mayall, he’s mostly gone back to Chicago blues masters for the majority of his blues covers choices. There’s Magic Sam’s ‘Out Of Bad Luck’ for example, which bristles with fiery intensity as the narrator takes umbrage with the cards that life has dealt him. And having delivered his lines passionately, Trout pours all he has left into his guitar playing with a trademark attack, albeit a sudden fade robs the track of its symmetry. He colours John Mayall’s enduringly poignant ‘Nature’ Disappearing’ with a country inflected blues harp and a light percussive touch that he matches with his own whispered vocal and delicate jazzy restraint. It’s an outstanding track on which everything falls into place feather light. His intricate solo is a good example of the light and shade of the album and the way the musical arrangements increasingly mirror the lyrical meaning and feel. There’s an unexpected cover of Floyd Lee’s 2003′s ‘Red Sun’, in a good example of a blues veteran serving up something a little more contemporary. Trout adds a big toned guitar and the band adds a deeply committed groove. The band serves up further intensity, as Walter substitutes a big toned solo for slide on Elmore James’s ‘Something Inside Of Me’ and the band relights the fuse on a rip-roaring version of Otis Rush’s’ ‘It Takes Time’, as they push that extra bit harder to match Walter’s incendiary attack. Walter Trout may have had to relearn how to play guitar following his fight back from liver disease, but here he’s back to his imperious best. He revisits the powerful river metaphor he used so tellingly on his own ‘The Bottom Of The River’, as he teams up mellifluously with special guest Robbie Krieger on slide guitar, on Mississippi Fred McDowell ’Goin Down To the River’. This entry was posted in ALBUM REVIEWS, ALBUM REVIEWS (Mobile), All Posts and tagged album, B.B. King, blues, Elmore James, Floyd Lee, guitar, Hound Dog Taylor, J.B. Lenoir, Jimmy Dawkins, John Mayall, Luther Johnson, Mississippi Fred McDowell, Otis Rush, review, Robbie Krieger, rock, Skip Edwards, Sugaray Rayford, Sunnyland Slim, Survivor Blues, Walter Trout. Bookmark the permalink.